I do like the Pythons but to call this Python is a difficult task. It watches like a children’s television program, with the occasional sweary or blast of flatulence-receiving applause. Still, its all good-humoured and fun, the set is technicolour and fun so you know you are there for a laugh. Unfortunately the set is devoid of anything Gilliam, but Michael Palin does put in an appearance as God ( a prerecording of him.) 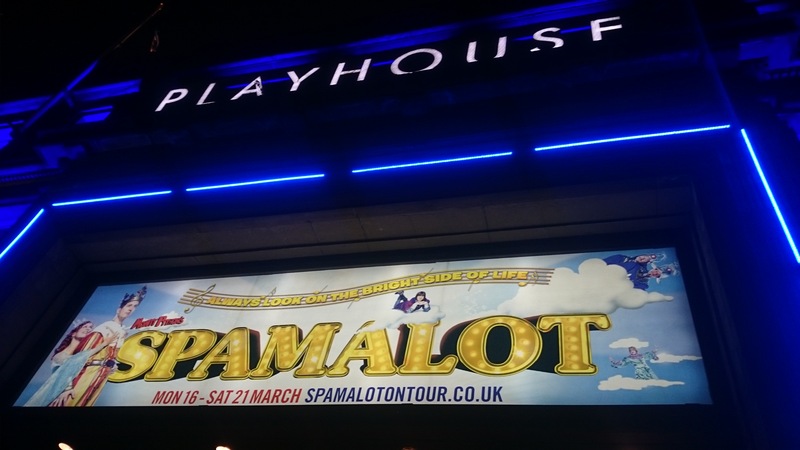 Spamalot has many of the qualities of panto really, and would have made more sense to me at Christmas. An audience member find himself dragged on stage for some jovial rip-taking and Joe Pasquale, who plays a nerdy bespectacled King Arthur, takes the opportunity on a couple of occasions to improvise. This is particularly well received when it is used to insult Vanessa Feltz. Sarah Earnshaw, playing the lady of the lake, has a powerful voice which ricochets around all four corners of the auditorium and this is meant as she performs as a disgruntled diva. A one point even parting the curtains to express her distaste at having not been given much of a part. There are continued popular culture references to Saturday and day time tV celebs to leave you in no delusion as to which people within society this is aimed at. This is a fun show, aimed at all age groups, and they are evidently all present at this showing. The songs are up-beat and happy, with jokes that are fairly predictable even when they aren’t the ones we’ve seen 100 times before. It’s definitely worth a watch, you’ll come out feeling pretty happy albeit slightly confused as to whether it’s Christmas or not!